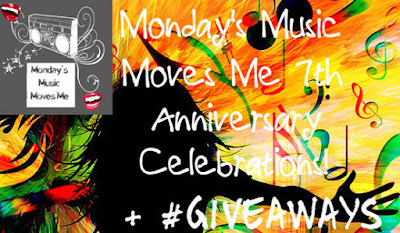 We are celebrating 7 years of music blog hop with Monday's Music Moves Me. Many of you have been with us for this wonderful journey that gets you up and dancing and gives some insight into new and old artists and music. I hope you have made some solid friends along the way and that you'll help us welcome some new dancers to the hop. Thanks for celebrating with us all these years! Join us each Monday or Sunday night or whenever you can share your tune, we'll come visit with you. Let's make life a bit easier by listening to some great tunes and making some cool bloggy friends. Take awhile and enjoy entering for your chance to be a winner! The code is good for numerous purchases, I figured it would be good for you to share on your blog . So everyone can get 50% off. Welcome to today's music. Seven years and going strong! I hope Monday find you with a smile and music to begin your week with light steps. We smoked up some ribs, had a few drinks and watched the fireworks. Hope you had a safe and happy 4th. BBQ with family and friends and watch the fireworks for the 4th of July. We went to a BBQ. We grilled with some family and set off some fireworks. It rained with lightning all day and night on the fourth so fireworks was cancelled. That weekend we grilled too much food and played beanbags, football and basketball. We had alot of family over and we had a great time. We had a family cook out, between showers.